PERFECTION!!! I seriously don’t know where to begin other than READ IT! American King was everything I hoped for and more; so much more. This is the final book in the New Camelot Trilogy and it was the best one in my opinion! You will need to read American Queen and American Prince first. If you haven’t read them yet my question is why? What are you waiting for? Go now and read!
" I will love her until the stars burn themselves out and hang like cold rocks in the lightless sky. " 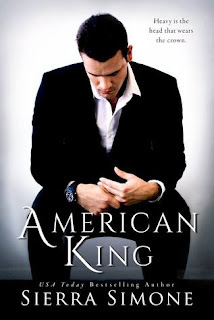 American King picks up right where American Prince left off. Embry just delivered some crushing news to Ash. Abilene is still evil (I was secretly hoping she would die somehow between AP and AK, but NOPE Sierra is that nice). Ash must deliver some news to Greer that could break her heart. I think that piece of info hurt me the most. This is where the ride begins. I wasn't sure how everything would play out. Could the three of them end up happy and together? Was there a higher power working in their favor? This book is full of ups and downs, love and hate as well as every emotion in-between. I couldn’t turn the pages fast enough yet at the same time I wanted to read slower to savor this incredible journey of love and sacrifice. AK is just as hot if not hotter than AQ and AP, so you may not want to read in public. I’m not kidding, it’s that HOT. Keep the BOB or your significant other close by you will need it. This series is EVERYTHING. I haven't loved the covers of all the book in a trilogy in forever. Seriously how amazing are these covers! I love them all!